Who are the Democratic superdelegates? This year’s Democratic presidential primary contest has been surprisingly competitive, and it’s not over yet. As the race enters its final weeks, Bernie Sanders and his supporters are stepping up their efforts to pry loose some of the “superdelegates” who are backing rival Hillary Clinton. Which made us wonder: Just who are these 700-plus party officeholders and insiders who automatically get delegate spots at July’s convention and can vote for whomever they want? 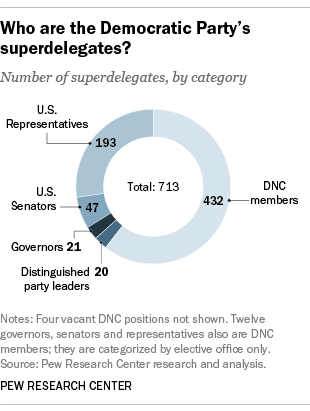 Superdelegates (not an official designation, by the way; their formal name is “unpledged party leaders and elected officials”) will account for just under 15% of all delegate votes at July’s Democratic National Convention. We worked from a list made public by the national Democratic Party (originally to Vox), and updated and corrected it to account for deaths, resignations and, in at least one case, criminal conviction. 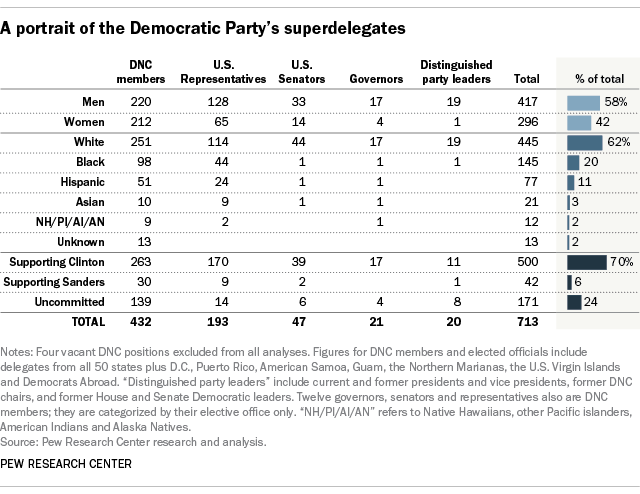 We came up with a total of 713 named superdelegates (a handful of slots are still vacant), then used a mix of official biographies, news reports, social-media postings and other sources to determine each superdelegate’s gender, race/ethnicity and, in most cases, age. The party’s official policy of encouraging gender equity and racial/ethnic diversity is most reflected among the superdelegates coming from the DNC itself: The male-female split is nearly equal (220-212), and non-Hispanic whites make up less than 60% of the total. The House members are similarly diverse on racial and ethnic lines, but two-thirds are men. Two-thirds of the senators and governors are white men, as are all but two of the distinguished party leaders. But based on their public endorsements to date, that looks to be a heavy lift. According to our count, 500 superdelegates are backing Clinton against just 42 for Sanders; that translates into 498 and 41 convention votes, respectively, because the superdelegates representing overseas Democrats have a half-vote each. (Fair warning: Any such counts are inherently imprecise – the Associated Press, for instance, has similar but slightly different numbers.) More than 85% of Democratic governors, senators and representatives are supporting Clinton, as are 61% of superdelegates from the DNC. Thirty-two of Sanders’ superdelegate supporters, or 76%, are white, versus 62% of Clinton’s superdelegates. About 41% of her superdelegates are women, versus 26% of Sanders’.